It looks like the sample sale season has well and truly started. Join the Lazy Oaf team for the ultimate pre-Christmas Sample Sale. 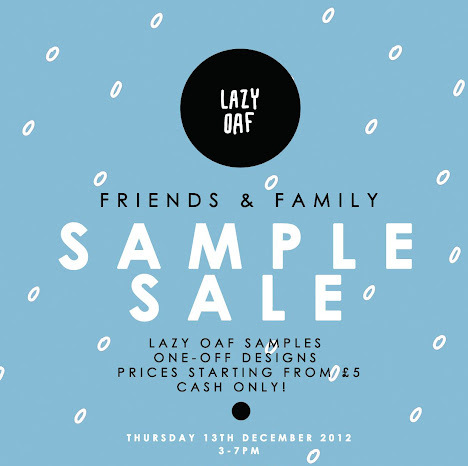 They are inviting you along to their studio to pick up top Lazy Oaf designs at all time low prices. * Discounted designs from current and previous collections. * Prices starting at £5. * One-off Lazy Oaf pieces. * Refreshments from Popchips & Rekorderlig. The sample sale is taking over their Islington studio from 3pm-7pm on Thursday 13th December and as with most it will be CASH ONLY. Nearest tube: Highbury & Islington or Old Street. Space is limited so if you're planning to attend: RSVP to press@lazyoaf.com.